Here's a little unexplainable item I read in the Daily Mail of March 21 this year. I say unexplainable, but to some it will be explainable. "My cousin died suddenly and unexpectedly at the age of 60. A few days later, I was sitting in the kitchen writing my book. I'm a numerologist and I was writing about repeated digits such as 111, 222, 333 and so on. Suddenly I heard my cousin's voice. He said, "Count the days." I didn't understand when he meant and then he repeated; "Count the days." This time he said it, I somehow understood that he wanted me to count how many days he had been alive. Using the website timeanddate.com, I entered his date of birth and his date of death. I was stunnded when I saw the result. He had lived for exactly 22,222 days!" 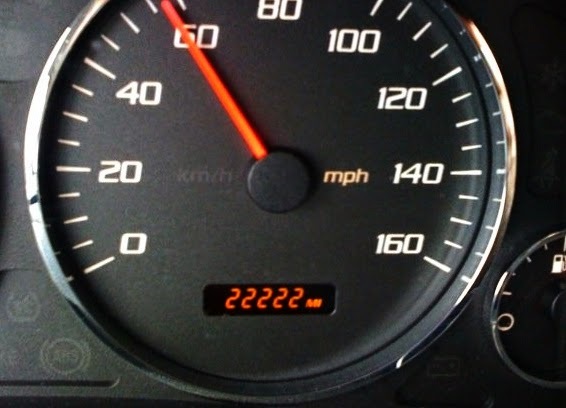 The photo at the top of the post: I saw this on Wits Intact - the caption is that the odometer reading of 22,222 was seen on the 2/22 while on the RR2222! Amazing! Number synchros are always fascinating! The number 222 has a very special meaning for me. This post has answered a request from me in that I had asked to see a sign of validation of something on my mind for the last couple of days. Voila, here it is!!! All these 2's may be exactly what I needed to see today.